Need Workers? Reap the benefits from Manufacturing Day on Friday, October 5, 2018. Click here to read the complete illustrated article as originally published or scroll down to read the text article. We are a country of producers and doers. We didn’t invent the wheel, but we manufacture the vehicles it runs on, and we continue to invent, and re-invent and innovate. All across the country manufacturers sustain a great legacy and amplifying their role in the American story is the annual blockbuster event, Manufacturing Day, which is set this year for Friday, Oct. 5. Now in its sixth year, Manufacturing Day is a way for companies in all sectors of manufacturing to open their doors and address the common misperceptions about what they do and how they do it. Smokestacks emitting pollution? Dark, dirty rooms? What century are you in? Opening that curtain to reveal a new age of manufacturing has, indeed, dispelled the perceptions associated with manufacturing that still associate the sector with the Industrial Revolution. However, National Association of Manufacturers’ (NAM) data reveal that 84 percent of respondents have a better view of manufacturing leaving a facility than they had going in during a Manufacturing Day event, and last year, a record 300,000 students, parents and teachers gained insight into modern-day manufacturing. “A key driver for us is to open the door and show people what goes on in a facility,” notes Carolyn Lee, Executive Director of the NAM’s Manufacturing Institute. 71% are more likely to tell friends, family, parents, or colleagues, about manufacturing after attending an event. “Everyone needs workers,” she said. And those future workers could be today’s visitors. Last year, there were 2,900 events at manufacturing facilities in the United States during Manufacturing Day, compared to 240 at the event’s outset in 2012. So it’s evident: companies are getting the message. Lee and NAM want to ensure that people understand how Manufacturing Day is part of a larger effort nationwide, so the momentum continues through continuous awareness campaigns, shining a spotlight on the event on its Twitter feed – @MfgDay – newsletters, emails and through a blog on NAM’s website. A presidential proclamation last year and visits of cabinet members to manufacturing sites further bolstered the initiative and both Lee and NAM President Jay Timmons foster recognition of manufacturing by visiting sites themselves. Last year the pair were at ACE Clearwater, makers of complex formed, machined and welded assemblies for the aerospace and power generation industries, in Torrance, Calif. The theme of that company’s event, “The Manufacturing Process from Conceptual Design to Final Assembly” featured 18 work centers showcasing traditional, innovative and futuristic, state-of-the-art processes and technologies. The company hosted 550 student participants in 2017 – who knows how many could become part of its future workforce? By far the biggest segment of untapped potential for future manufacturing workers is women. NAM, says Lee, is also promoting a large initiative to bring women, a sector “sorely underrepresented in the current manufacturing workforce” into the conversation. As part of Manufacturing Day, and throughout the year, the organization honors women who are leading or are emerging as manufacturing leaders. Female role models, Lee stresses, are vital to bringing more women into manufacturing. A Deloitte study of women in manufacturing shows that only 29 percent of manufacturing employees are women, despite the fact that women make up 47 percent of the U.S. workforce. From the building façade to the shop floor, exposing future manufacturers to the modern production facility is the only requirement of those companies that register to participate in Manufacturing Day. The goal is to highlight the many positive aspects of working in the industry, and how manufacturing contributes to the community and the economy. Manufacturers can do this via plant tours, job and educational fairs, community events organized in partnership with other businesses and economic development groups, and breakfast, lunch or dinner celebrations with roundtable discussions involving community and business leaders – in particular, is the promise of encouraging a STEM (science, technology, engineering, math) curriculum in local schools. A particular manufacturer’s event will be listed on the MFG Day website (www.mfgday.com) but companies may also choose the “invitation- only” status. To aid manufacturers in establishing a connection with their guests on Manufacturing Day, NAM offers several tips; among these is to not assume visitors know the details of how a product is made. Creating a company story that the lay person will understand is a large and critical part of offering a good plant tour. NAM suggests talking about how the company was started, what is made there, main markets and how these products help the world at large. NAM cautions that companies can’t show everything. “Pick a few stops that represent key stages in the production process and allow you to demonstrate the progress a product makes through the shop,” NAM advises. It’s also important to offer hands-on experiences for visitors – let them pick up and hold a product that they have seen produced on the plant floor. Manufacturers should particularly cater to student visitors, NAM advises, which gives them the opportunity to provide advice on careers, training and the educational coursework needed to work at this particular company. Created by Founding Partner Fabricators and Manufacturers Association, International in 2012, MFG DAY has enjoyed support from many organizations aligned with its mission of positively changing the public perception of modern manufacturing. Organizations that have played a vital role in working with FMA to successfully grow this event include the National Association of Manufacturers (NAM), the nation’s largest industrial trade association; the Manufacturing Institute (MI), and the National Institute of Standards and Technology’s (NIST) Hollings Manufacturing Extension Partnership (MEP). More information is available on the NAM website, www.nam.org. Carolyn Lee is Executive Director of The Manufacturing Institute, the non-profit affiliate of the National Association of Manufacturers (NAM), the nation’s largest industrial trade association. Carolyn drives an agenda focused on improving the manufacturing industry through its three centers: the Center for the American Workforce, the Center for Manufacturing Research, and the Center for Best Practices. In her role, Carolyn leads the Institute’s workforce efforts to close the skills gap and inspire all Americans to enter the U.S. manufacturing workforce, focusing on women, youth, and veterans. Carolyn steers the Institute’s initiatives and programs to educate the public on manufacturing careers, improve the quality of manufacturing education, engage, develop and retain key members of the workforce, and identify and document best practices. In addition, Carolyn drives the agenda for the Center for Manufacturing Research, which partners with leading consulting firms in the country. The Institute studies the critical issues facing manufacturing and then applies that research to develop and identify solutions that are implemented by companies, schools, governments, and organizations across the country. 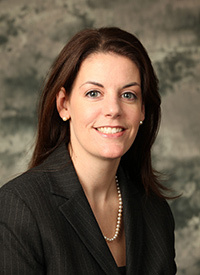 Prior to joining the Institute, Carolyn was Senior Director of Tax Policy at the NAM beginning in 2011, where she was responsible for key portions of the NAM’s tax portfolio representing the manufacturing community on Capitol Hill and in the business community and working closely with the NAM membership. She served as the Director of Legislative and Government Affairs at the Telecommunications Industry Association, Manager of State and Federal Government Affairs for 3M Company, and in various positions on Capitol Hill including as Legislative Director for former U.S. Senator Olympia Snowe (R-ME), and as a senior legislative staff member for former U.S. Rep. Sue Kelly (R-NY). Carolyn is a graduate of Gettysburg College in Gettysburg, Pennsylvania graduating with a B.A. in Political Science. She resides in Northern Virginia with her husband and three children. Are manufacturers becoming digital businesses?